Now that it’s Fall, I want to start this post with some positive memories, places I’ve been this summer, and bookstores I would love to return to. Just keep writing is my mantra right now, and a little negativity in terms of reviews is all part of the process, and interesting. Besides, I tend to write about darkness in people, those who are empathetic or, often, those who cannot issue forth any such joy in their lives. They are curious to me and I love trying to figure out why people act the way they do, why a decision means so much in the heat of the moment, or in a panic. And, the best advice anyone ever said to me about this publishing process? “Justin, not everyone is going to love your book.” Not taking something personally is the way I handle most things that rain down in my vicinity. Here is the front window of my local Anacortes bookstore, Watermark Book Co. right before I was to give a reading at the local library. 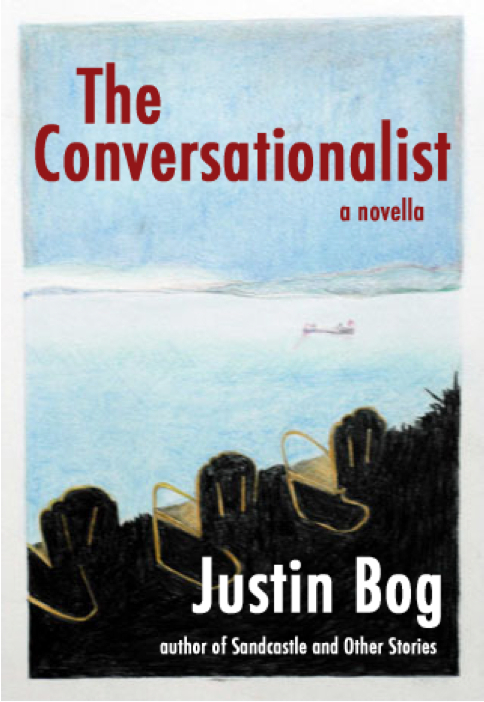 This evening turned out as good as can be expected and I read the first chapter from my new longer novella, The Conversationalist, a psychological thriller, and the short story Typecast, from Sandcastle and Other Stories. Following the reading a group of us gathered at The Majestic Inn for wine, lots of wine. 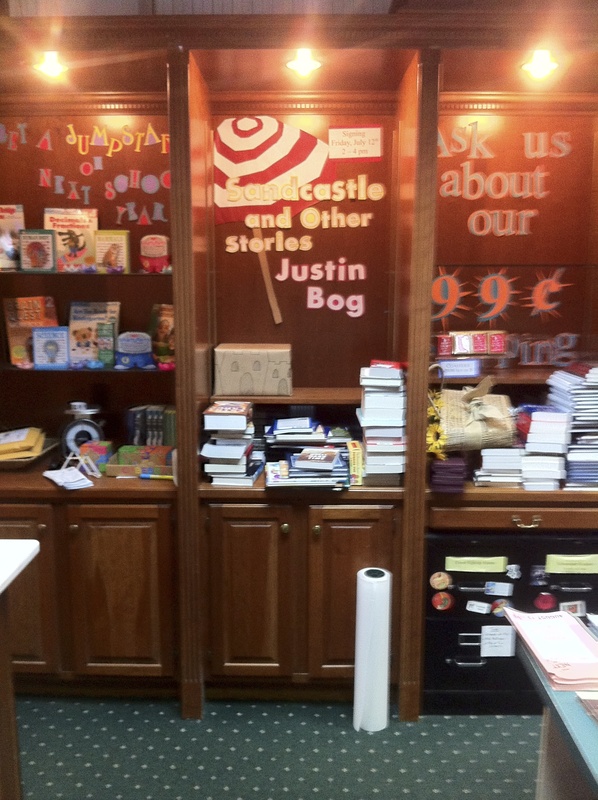 Between The Covers Bookstore in Harbor Springs, Michigan, where I used to be a bookstore clerk way back in the early 90s, hosted a signing this past July, and I loved seeing the new location, visiting with my longtime friends, and meeting new book lovers. A few days after this signing I travelled to the neighboring lakeside town of Petoskey to give a signing at McLean & Eakin Booksellers. 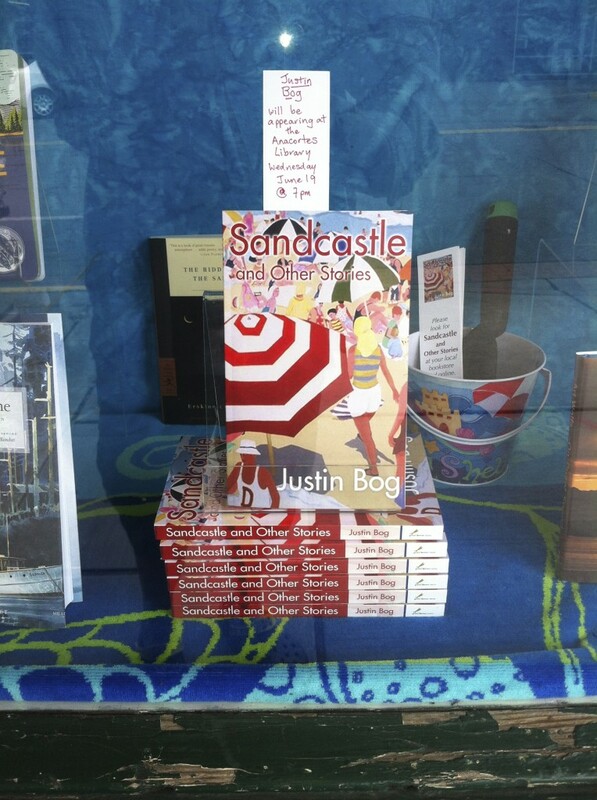 This interior photo and the title of Sandcastle and Other Stories behind the counter was thrilling to behold. What a fun time. I miss living in this northern Michigan area of the country. Thank you to both bookstores and I hope to make my way back. 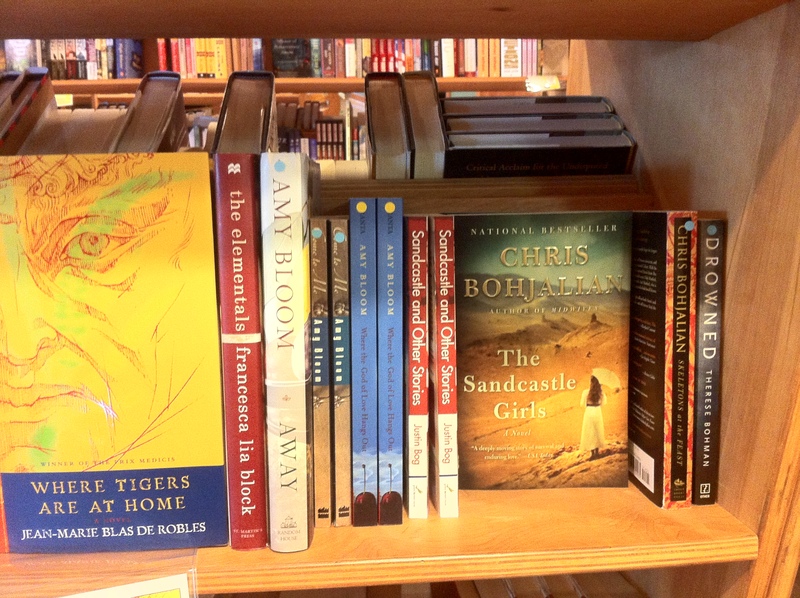 Seeing Sandcastle and Other Stories on the shelf at Village Books in Fairhaven, just up the Chuckanut Drive, was a dream come true. There is good in the writing life to oppose the less than fruitful parts. I try to never forget this. It was cool to see Chris Bohjalian’s novel The Sandcastle Girls neighbor to Sandcastle and Other Stories. What a nice coincidence! I love the writing life, warts and all, and bad reviews are part of the game, and come from all sorts of people. I do comment on Goodreads to anyone who takes the time to read my book—and I do try to thank each and every single one, for good or bad, for taking the time to read. It’s a huge commitment for any reader—even if they received the book for free! A reviewer’s opinion, even the negative ones, are interesting, and are just as valid as a positive reviewer’s opinion. I don’t respond on Amazon: too scary (hehe), but Amazon now runs Goodreads (I’ve heard they have just instituted new “anti-bullying” policies there). Most book reviews are really book recommendations. Read that! Don’t read that! I write book recommendations for the books I love, and I want to recommend good books to readers. I don’t write negative reviews since there are already so many who have that ground covered, and, more importantly, I am a peer to every other writer, and don’t feel comfortable bashing a fellow writer—it’s a struggle to finish writing one book, and can take someone anywhere from three days, one day if you’re Dumas, to ten or more years to complete. It took me a lifetime to write this book. I’ve heard that said too. If someone doesn’t like a book, any book, even mine, they have every right to say so. It’s my job to write something better, something that will entertain readers. I love what I write, first and foremost, and maybe there will be one other reader who also loves it. It’s the risk any creative artist, writer, actor, musician, painter, dancer, takes in putting original work out there to be criticized. Best of luck to all who toil away. Finding my muse making pancakes in the new kitchen . . . he made such a mess. Zippy and Kipling laugh at me all the time. 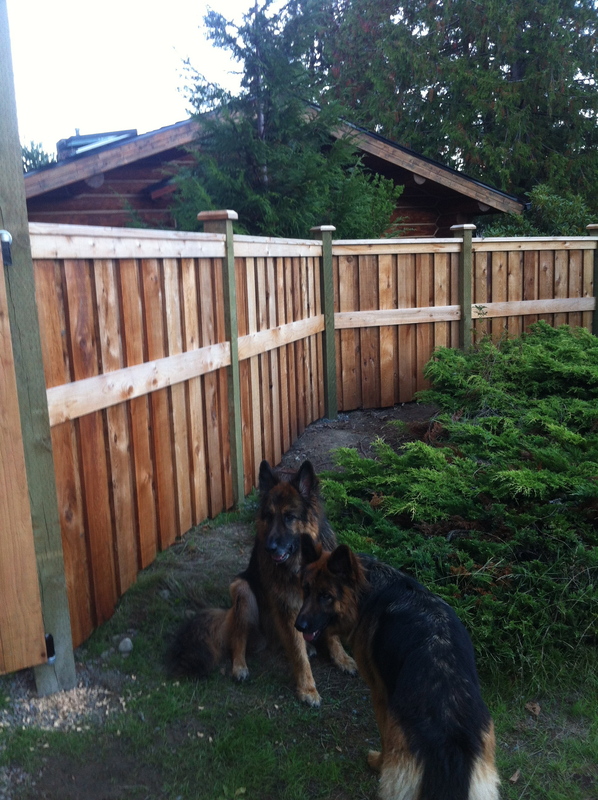 Here we are outside our new log cabin and the new fence with hobbit gate. We’re almost moved in completely. 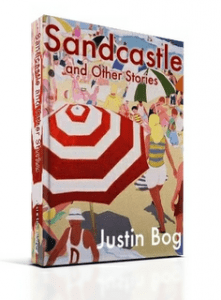 To buy the Green Darner Press paperback or download a free sample of Sandcastle and Other Stories or The Conversationalist for kindle readers or for iPad, PC, Mac, or iPhone with the kindle app, click HERE. While at Amazon, Barnes & Noble, the iBookstore, please hit the Like button. It’s a great way to show support for your favorite authors and their books. And please leave a review if the book hits you well. Justin, I loved the pacing and contemplation of this. Appreciate you. Thank you, Toby. I feel the same about you. I am in awe of your writing life, and can’t wait to read more of your books. (Love your book covers too!) I see too many bad reviews to good books. People even bash the classics. Maybe this makes people feel better, snarky, happy to trounce a work in what is thought of as “witty” fashion, but it’s an empty practice, and the “gotcha” feeling fades and then repeats itself. Today’s social media interaction, the quickness of saying something, has made being critical feel hollow to me. People don’t meditate on something before sharing their opinions, for good or bad. It’s a lot of knee-jerk reactions posing as reviews too. The movie business is worse. People just say, “Don’t go to that movie. It was horrible. Wait till the DVD comes out, or skip it.” But I love Woody Allen! I am also stuck in the “If you don’t have anything nice to say” generation mores, and happy to be here.